Let's face it: while group exercise has many benefits such as allowing your facility to stand out in the crowd as well as serving as a revenue source, the reality is that it's hard to keep members engaged with it. It's one thing to attract new members to a fitness class but a whole other thing to keep them there. The solution is actually quite simple: switch it up. There's nothing more genius than combining two of the most popular fitness class types: Zumba and Hiit. STRONG by Zumba® combines body weight, muscle conditioning, cardio and plyometric training moves that are perfectly timed with the beat of the music. Combining the best of both worlds, this workout will leave members feeling re-energized. The fun doesn't stop there - Zumba can be combined with Tabata to create a fast-paced and explosive workout: Zumbata. The best part? Unlike it's counterpart above, Zumbata doesn't require your instructors receive extra training. Simply add tabata workouts between dance routines and you're good to go. No extra certification fees, no new equipment, just a new combo. Your members won't see this one coming! Who doesn't play the air drums every time they hear Phil Collins' 'In the air tonight'?! Pound is the latest fitness trend which takes playing the air drums to a whole new level. 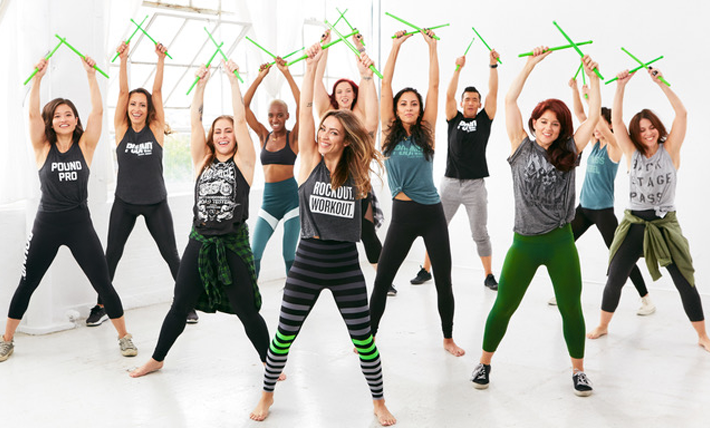 With nothing but some drum sticks, members are guided through a series of drumming moves which work not only the arms but put core and lower body to the test, all while letting members show off their inner rockstar. Switching things up doesn't always mean having to introduce a new workout routine. Members are more health-conscious now than they've ever been before and with the rise of wearables, they're more aware of vitals such as their heart rate. With systems like Polar Club, you can easily add an element of heart rate training to group exercises: all you need is a screen and chest monitors and members can track, measure and compare their performance as they workout. It's no wonder Orangetheory Fitness has seen success with attracting new members. Rowing machines don't always get as much love as treadmills or ellipticals but they should! Not only does rowing provide a full-body cardio workout, but similar to spin bikes, it offers up an opportunity to lead group rowing exercises. Fitness centers like City Row have developed routines that incorporate rowing into group exercises for a high-intensity, aerobic workout. Break your members' repetitive routine by exposing them to new machines and workouts.